FLICKR STATS IS DESKTOP software that downloads Flickr Stats data for Flickr Pro. When I use it, I can store Flickr data locally from more than 28 days in the past. Flickr Stats uses an API call to compile a single SQLite database file. I'm using the database in a third level web analytics module where I teach students how to effectively measure online activity. The Flickr Stats package also shows spark-lines charts of collected data (yearly, monthly, daily). TWEETCASTER, THE TWITTER CLIENT for Blackberry and Android, has given me very stable performance during a month of constant use. I recommend it as an Android application. In addition to standard Twitter functions, TweetCaster allows me to set up multiple Twitter accounts (essential when no one is listening so I can tweet myself discreetly), integrated retweets (allowing you to modify the retweet), integrated Twitter lists, notifications that vibrate the phone if you prefer, offline tweet caching for thousands of tweets to read while on the plane, URL shortening (and previews), phot0 attachment, threaded direct messages, threaded conversations, font/theme customization, landscape support, profile editing and tweet filtering. 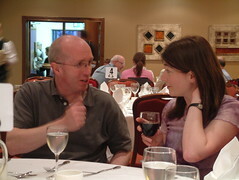 I CHATTED WITH Mark Rock and several Irish users of Audioboo yesterday and think we enjoyed a eureka moment about threaded audio conversations. Audioboo takes the idea of radio chats to new level. Christian Payne is showing how this can be a very effective community tactic. I also think Audioboo represents the active layer of podcasting because you don't have to know how to spell the word "podcast" in order to create your first shareable audio snippet with Audioboo. Like many people, I listen to audio conversations on the air several times a week. The liveliest are people arguing in conference calls on Joe Duffy's Liveline at 1345 every weekday on RTE Radio One. Afternoon drivetime radio also offers conversations between differing opinion-makers. In both cases, the radio stations connect the voices through phone calls and broadcast masts. 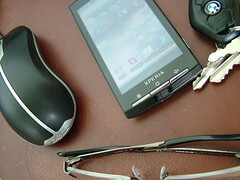 Most of these broadcasts become podcasts where the conversations reach another audience, some listening to the time-delayed conversations as podcasts on their phones. THE LADY IN WAITING starts my 10-minute round-up of the Irish Sunday papers this week as Camilla Long reports on how Kate Middleton has done her training, stopped partying and cleared her diary. All that's left is waiting. I used my SonyEricsson Xperia X10 to record this week's Qik clip, then discovered its audio recording is much better than the Nokia set-up I normally use. So I shoveled the audio over to Audioboo and hope it appeals to regular listeners over there. Citations to several main topics appear after the break. MY PRESENTATION (14-minute video) to the e-learning summer school (#ELSS10) with the Dublin Higher Education Alliance sparked some questions that I will answer in a separate blog post. Below the break, I cite the primary resources that I use to create multimedia content as a third level lecturer in Tipperary Institute. POUL HOLM gave me my first understanding of Trinity's Long Room Hub today as I listened to him offer an insider's view of the processes involved in "unmuting" different parts of Trinity's faculty to facilitate the convergence of digital technologies in the humanities. 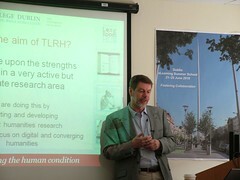 Holm's presentation occurred during an e-learning week session run by the Dublin Region Higher Education Alliance in DIT. The Long Room Hub has become a strategic objective of TCD. Complete with its own YouTube channel, The Long Room Hub could evolve into an all-Irish initiative for digital arts and humanities. That's been mooted at Farmleigh by luminaries who discussed how to elevate Ireland's creative economy on the international stage. The Trinity initiative has a very creative and reflective component and if funded (around 12m euro is needed), new content would emerge by connecting data points that will produce highly engaging experiences. THIS IS MY THIRD time attending e-learning week in the Dublin Institute of Technology. I go to learn new things from people like Kevin O'Rourke (at left making his point), Morag Munro, Mike Brady, Brian Mulligan, Niall Watts, Jen Harvey and Eamon Costello. Rebadged as a collaboration between third level institutes in Dublin, the 2010 event facilitates truly excellent talks and workshops. I have watched podcasting evolve in each of these events and this year my session on Audioboo followed Mike Brady's talk on podcasting his lectures. Across Ireland, enthusiastic teachers from primary to third level attend these upskilling events during the summer. Each year, we get closer to the time when educators at all levels can dip into each others' streams, learning about the tools and the technology that can deliver innovation into the classroom. Events like the e-learning summer school (#elss10) at DIT have figured out the perfect balance between one-way presentation, lively audiece crossfires, deep-diving workshops, excellent catering and an evening dinner to top off proceedings. EAMON COSTELLO shared Camtasia, Screenr, and accelerated learning through Google Apps for Education. I need to fold Screenr into my academic practise next semester, once I verify the clips can be pushed to the dumbest handsets in the purses and pockets of students. A SOFT VIBRATION on my desk told me I should look at something sent to me via an Android application so I stopped typing on my laptop and swiped down on my Xperia X10 handset to see what was cooking. The X10's Tweetcaster app told me about a conversation I was monitoring. It offered me a vibrating nudge before Seesmic alerted on my desktop. Because of its tendency to offer me early alerts to business-related items, I now consider my Android phone the equivalent of a third monitoring system. Besides being reliable, it's very mobile. The most common alerts are from updates to newsfeeds via News Rob, Tweetcaster mentions, Vark questions, and free changes to software I've downloaded from the Android Market. I'm using the summer months to tweak my X10's long range radar so that I can see updates students make to continuous assessment material. I want to set up free and reliable alerts to blog posts, social bookmarks, music tracks, and calendar events. After a month of toying around with various settings, I have to say that the flexibility availed by several different programs I've found in the Android Market is delivering a very smart experience to alongside my laptop mouse and in my shirt pocket.